The former Jam frontman told the Radio Times that he would never become a judge on competition shows like The Voice or The X Factor. 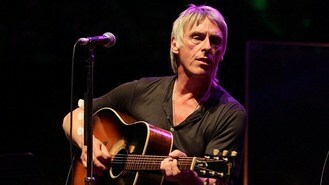 Weller, 53, called TV talent shows "Saturday-night viewing for the masses", adding: "Would I be a judge? Would I hell." Asked whether Simon Cowell should be given some credit after X Factor alumni One Direction became the first British band to hit number one in the US with their debut album, he said: "Dunno, 'cause I've never heard 'em. I do know what you're talking about. But I wouldn't give him anything, personally." He told the magazine: "I'd be too embarrassed to be on those shows. You get some of these kids who think they're a little bit 'edgy', got a bit of a Pete Doherty haircut. "You're not edgy, really, mate. Otherwise you wouldn't be on an effing talent show, would you?" Pianist and TV presenter Jools Holland, who was also interviewed by the magazine, agreed, saying: "Yeah, you'd kick the microphone over, say, 'It's a load of old b******s, see you later..."
Holland added: "Budding artists need a break, I suppose. But music's not like a competition. It's an art form. I wouldn't knock the competition shows if that's what people want to do. "But there's a difference between having it like a game show and having it as something that connects with your spirit and moves you...that's what music's supposed to be about." Ex-Style Council star Weller, who recently notched up his fourth number one album of his solo career, has previously criticised The X Factor, calling it "very cheap programming and the lowest common denominator stuff".